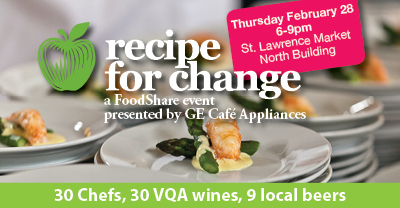 On February 28, more than THIRTY celebrated Chefs, both local and from the surrounding areas, will gather in the St Lawrence Market North Building to display their culinary talents and contribute to Recipe for Change, an annual Food Share event in support of food literacy for students across the GTA. • José Arato and Dolores Smith, Pimenton Fine Foods, The Olivar Corp.
Who knows what auction items will be up for grabs this year?! I know where I’ll be on the 28th…. See you at Recipe for Change! Now go out and get your ticket! !